A man is washed ashore on a lonely beach on the west side of Harris, in the Western Isles. He has no idea how he came to be in the water, only that his life jacket must have saved his life. He has no idea where he is, and he realises that he also has no idea who he is. It's as if he has found himself in the body of a stranger, "in whose uncharted waters I have been washed up in blind ignorance". And then he becomes aware of the consciousness of something dark, of something so awful that he has no desire to remember it. And so starts a truly outstanding novel. Yes, it turns out there's been a murder, and we are reintroduced to Detective Sergeant George Gunn as he seeks to establish how a man came to have his head bashed in on one of the remote Flannan Isles, located in the Atlantic twenty miles west of the Isle of Lewis. The Flannan Isles have been home to an enduring mystery since the three keepers manning the lighthouse there disappeared in December 1900. But this time there is at least a body, only no-one knows who it belonged to, or how or why it came to be there. It is rare to read a murder mystery in which the murder is only secondary to the central enigma. We share the main character's frustrations as he struggles to find out who he is, and why he is there, in the face of his earlier apparent efforts, before whatever cost him his memory, to live as anonymously and secretively as possible. And we share his deepest fear: is he capable of murder? Meanwhile, another strand of the novel follows the efforts of a teenage girl in Edinburgh to learn the truth about her father's death two years earlier. "Coffin Road" takes us back to the general area of the author's earlier "Lewis Trilogy", and we meet a character we've met before, while two more are mentioned in passing. But out of a setting that might as a result seem familiar comes a novel that feels utterly different. Seeing much of the story develop through the eyes of a character who in many ways is a blank canvas is utterly fascinating, and the sense of mystery only deepens as the novel progresses. 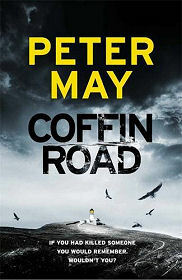 Peter May is one of the most accomplished novelists writing today. Each time we read his latest book we label it as his best yet, and we make no apology in doing so again. "Coffin Road" is a book it really is very hard to put down. The author has become a master of misdirection, and the ways in which the strands of the book entwine confound the reader's expectations right to the very end. And what a absolutely superb end it is, in which the modern mysteries are resolved alongside, perhaps, a much older one.